No doubt “pilot losing control” is behind many drone incidents and crashes. But what’s behind that “loss of control?” After all, even small recreational drones depend on a host of subsystems – GPS, receiver antennae, WiFi I/O ports and electronic speed controllers – to stay in the air. Lose one and that UAV becomes a UFO pretty quickly. Regardless of how a particular drone is used or how much it costs, all drones are susceptible to similar fault and failure conditions. These conditions can cause problems that range from the merely annoying (a drone that won’t start or take flight) to the catastrophic (a crash that causes major property damage or personal injury). A battery that catches fire during charging or a mid-flight failure due to any of a number of electrical issues are common examples that highlight why robust electrical protection is essential. 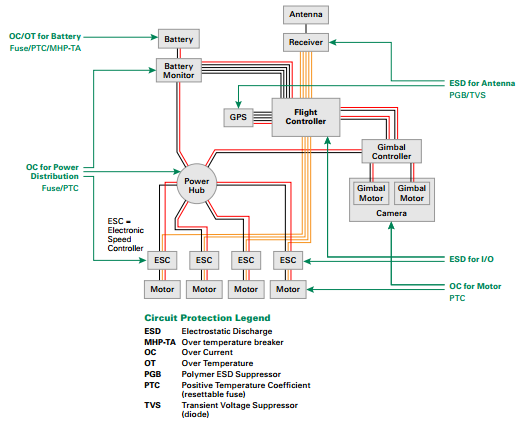 Fortunately, a growing array of tools and techniques are available to implement passive battery safety systems, electrostatic discharge (ESD) protection, and stalled motor protection. When there is significant capacitance in a reed sensor, reed relay or reed switch circuit, the peak current and energy switched by the reed contacts should be considered. However, if the capacitance is less than 100 nF at 5 V or 0.1 nF at 150 V, and the cable length is less than 10 meters, the capacitance will not significantly effect switching life. If a capacitor is placed in parallel across the reed contacts, the peak current will be determined by the load voltage, the contact resistance, the wiring resistance, the ESR of the capacitor, and the inductance of the circuitry. Because the resistance and inductance in the circuit path are likely small, the peak current can be amperes or tens of amperes, exceeding the maximum switching current of the reed switch, reed relay or reed sensor. Even if the maximum switching current is not exceeded, switching life may be reduced. A capacitor not directly across the reed contacts may still generate a high current spike when the reed contact is closed. Depending on the circuit arrangement, the peak discharge current may occur when the capacitor is charged or discharged. Components other than capacitors can have significant capacitance, including long cables, MOVs (Metal Oxide Varistors), and MOSFET gates. Tankless water heaters are becoming a widely popular solution for water heating needs. The availability of hot water on demand and the perceived limitless supply of hot water make these types of water heaters much more attractive than traditional tank water heaters. These water heaters also provide long-term energy savings since energy is used only when there is a demand for hot water. 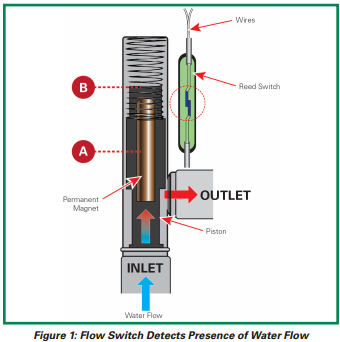 In order to effectively heat the water when there is a demand, a sensor is needed to detect the flow of water.